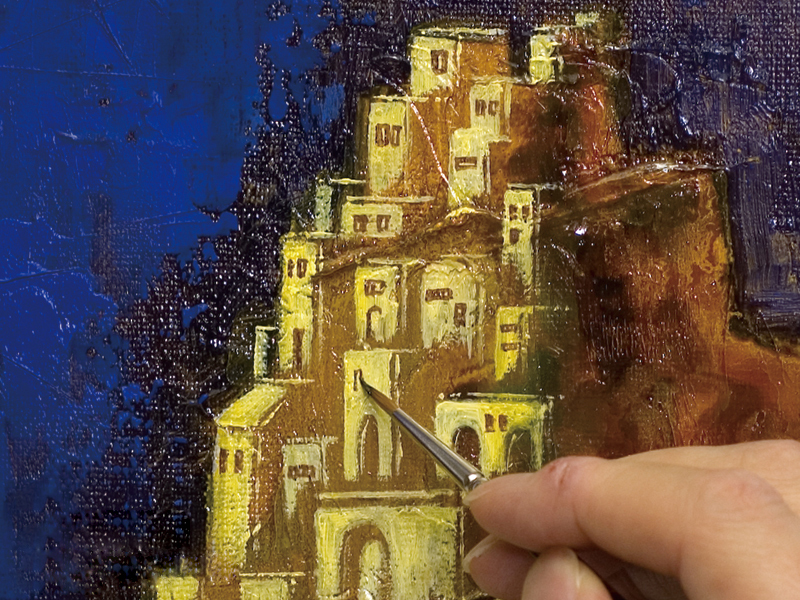 Oil paint brushes have fine tips that mix well with oil and let artists take advantage of the viscosity, transparency, and other unique qualities of oil paint. 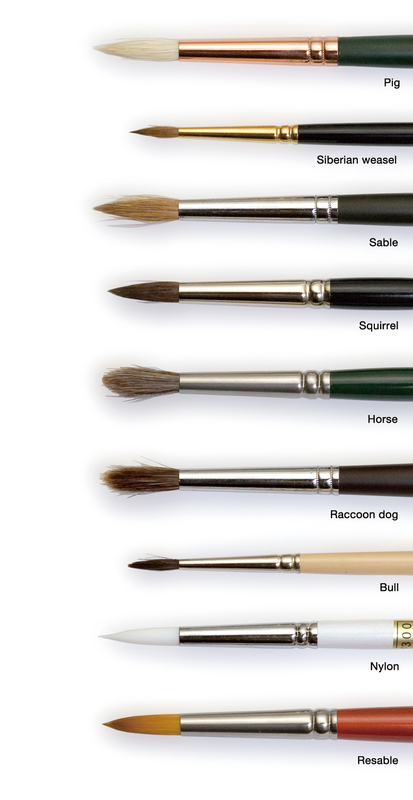 With fine tips made of various types of animal hair and a diverse range of shapes and sizes, the many oil paint brush varieties available give artists the ability to draw different line shapes and paint in an array of styles. The fine tips are made of either coarse or soft hair. Brushes with coarse hair have a firm touch, making them good for filling, applying thick coatings, and leaving visible traces of brushstrokes in the work. 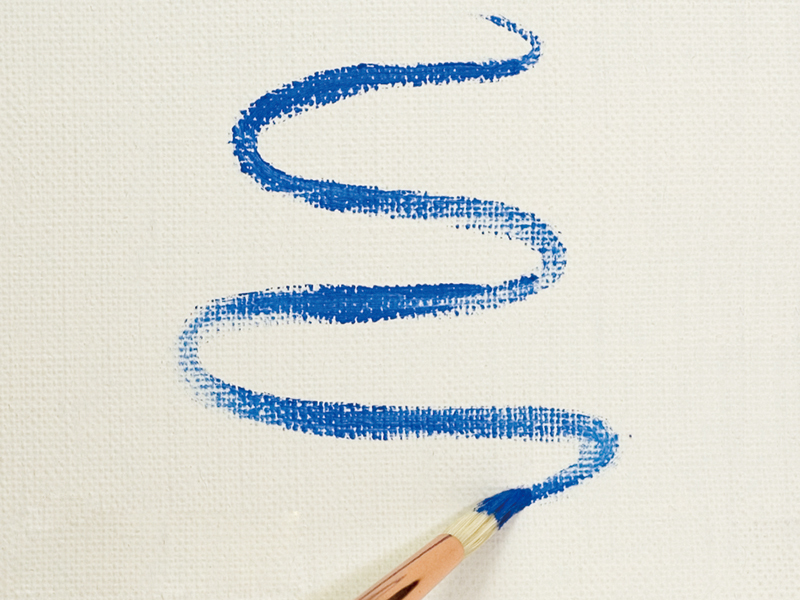 Soft-hair brushes, which are more flexible and hold paint well, are suited to painting light strokes and adding finer details without making the brushstrokes stand out. 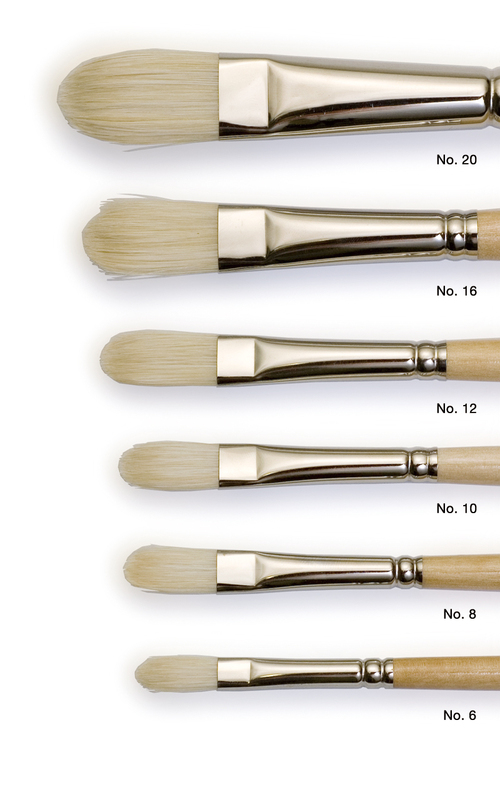 Commonly made from pig hair, coarse-hair brushes have hard, thick bristles that boast high elasticity and durability. 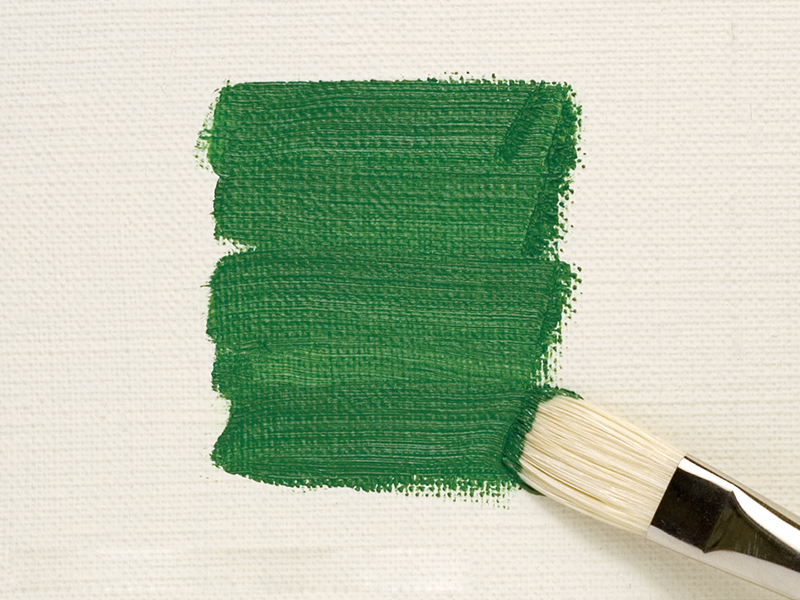 The tips of these brushes usually have two to three split ends, which help retain paint. Most of the pig hair used in coarse-hair brushes is produced in China, with the most highly regarded varieties coming from the Chongqing area. Finely processed (bleached), high-quality hair is slightly amber-colored and very flexible. Soft-hair brushes use hair from animals like sables (martens and other members of the weasel family), squirrels, horses, bulls, and raccoon dogs, but there are also soft-hair brushes made of nylon and other synthetic fibers. The most prized type of sable hair for oil painters comes from the Siberian weasel (kolinsky), a marten native to Siberia and northeastern China. In addition to being incredibly flexible, oil paint brushes made of Siberian weasel hair have tightly formed tips and hold paint extremely well. 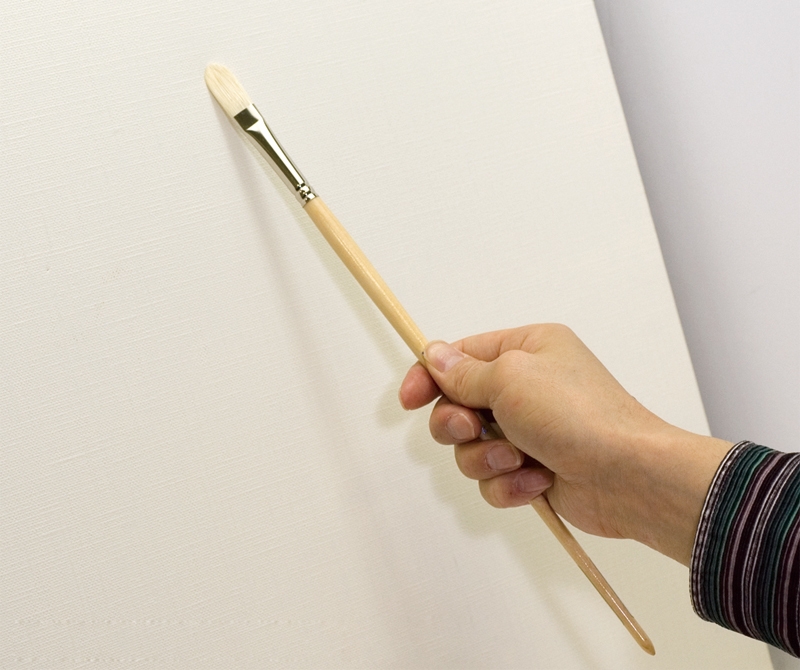 Less expensive brushes have tips made of synthetic fibers such as nylon and are better suited for acrylic paints. Some manufacturers perform special processing on synthetic fiber or use a mixture of synthetic fiber and animal hair to create brushes (“resable brushes,” etc.) that approximate the feel of brushes made purely from animal hair. 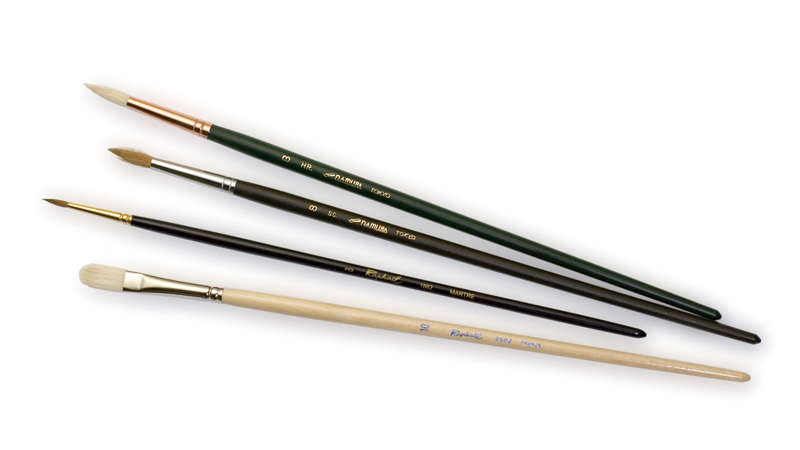 Brushes also come in many tip sizes (with larger sizes having higher product numbers) and shapes (such as flat and round) designed for different painting applications. 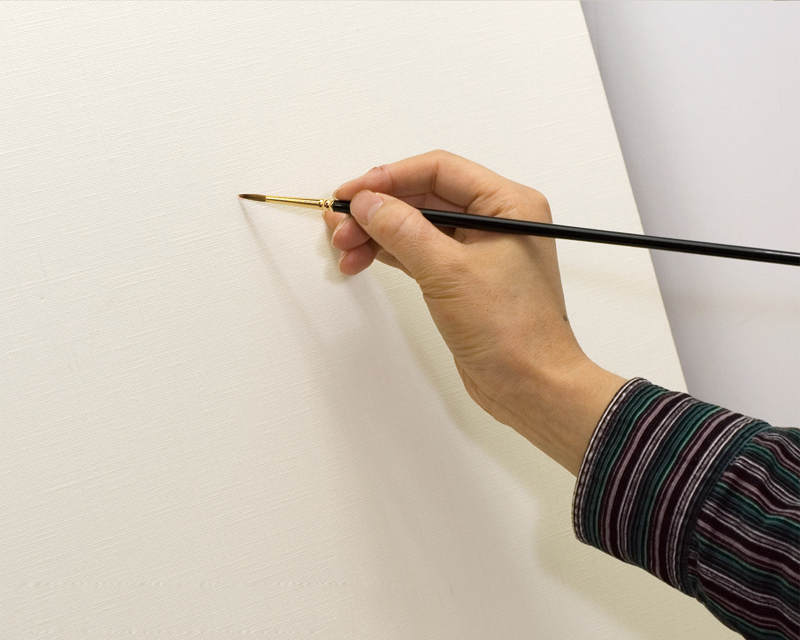 Artists can use flat brushes for a wide range of purposes, including making relatively broad, even strokes, filling areas with touch, and making sharp curves with the edge of the brush. The flat brush category also includes several specific varieties: the flat type, the filbert type (more rounded than the standard flat type), the angle type (whose tip is cut at a downward angle), and the fan type, just to name a few. Each variety has a different feel and produces different line forms. Round brushes are designed to hold paint well and maximize stroke smoothness, making them good for painting extended, flowing lines. 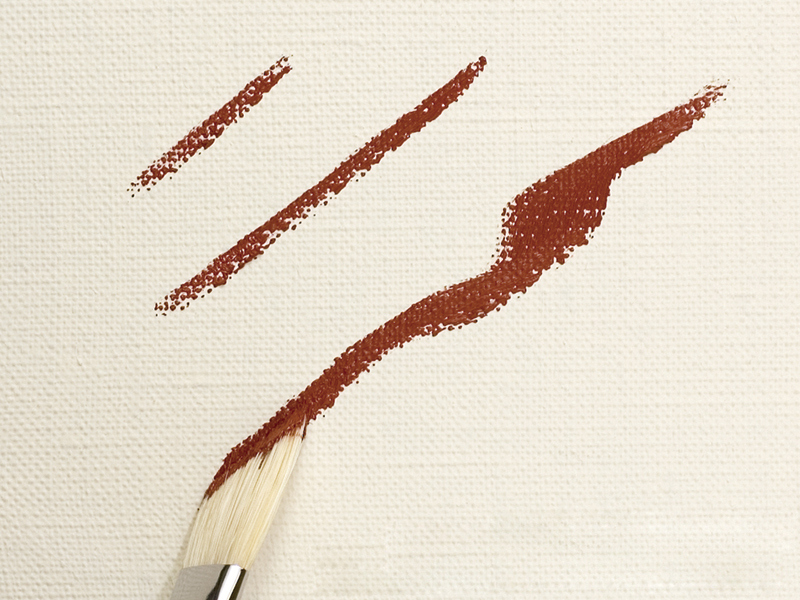 Brushes with particularly fine tips are ideal for painting delicate lines and achieving highly detailed expression. 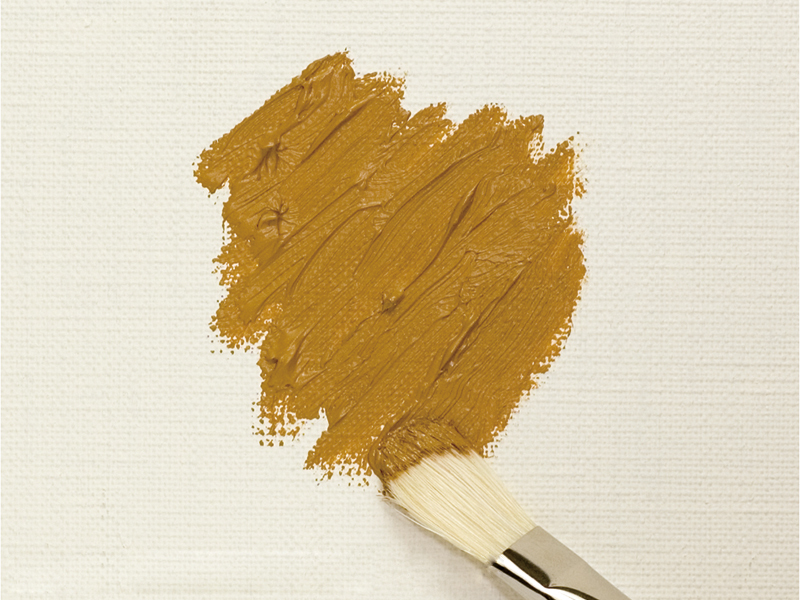 After using an oil paint brush, wipe the paint from the brush with a rag or similar item and then put the entire brush into brush-cleaning fluid. Next, wash the brush with soap and let it dry well. 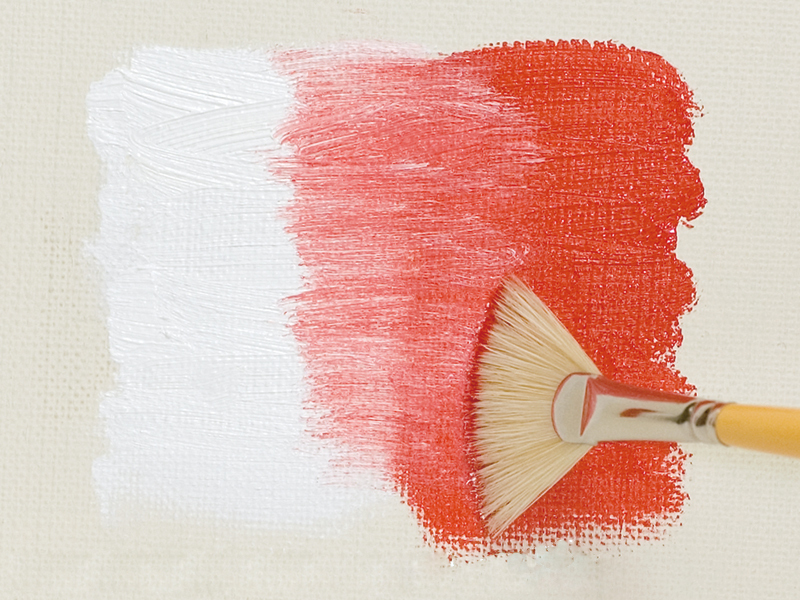 If paint solidifies on the tip of the brush, you can soak it in paint remover to dissolve the hardened paint. 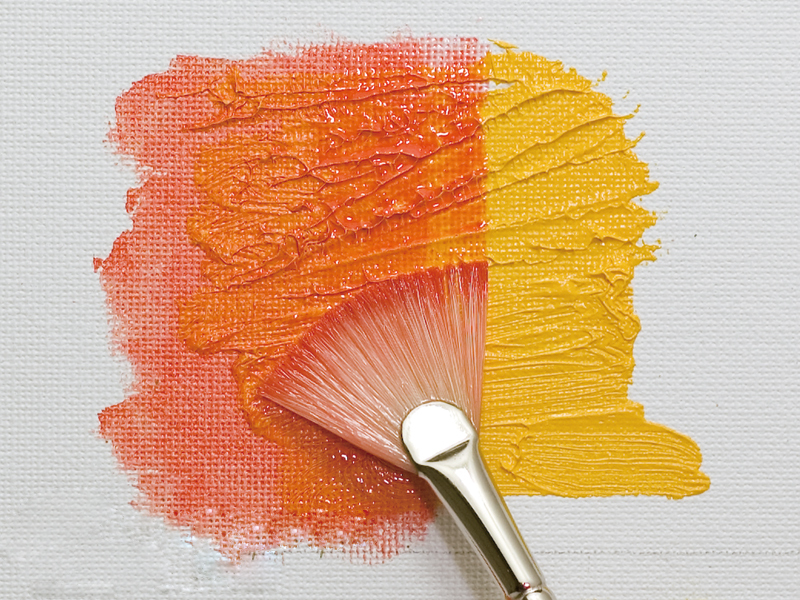 Oil paint brushes are available for purchase at general art supply stores.